No, we did not install the differential cooler at this time as the majority of the races are sprint races of 30 minutes or less. If we ever consider doing a race that lasts longer than an hour, i.e., 12 hour or 24 hours of Sebring we will need to install a cooler. At this time have not seen any diff oil showing signs of excessive heat. We are running a 3.54 Dana currently. If for some reason we went with a higher gear ratio and were spinning the gears faster we might consider it as well. All and all the Superformance designed catch can is a poorly designed bandaid for an incorrectly installed differential breather location. It’s as if they were trying to create an Accusump without the pressure behind it to keep the oil in the differential with the catch can and placement. Once the lubricating oil leaves the differential the damage is done. If everything is working correctly the only thing in the vent hose and catch can will be vapors, nothing more. Last edited by CompClassics; 04-15-2019 at 05:38 PM..
JWe are running a 3.54 Dana currently. Morris, eschaider and CompClassics like this. They must love you in court. How can someone as obsessive as you have chosen beige for a car? Don't know what this site would be like without you. Once the lubricating oil leaves the differential the damage is done. If everything is working correctly the only thing in the vent hose and catch can will be vapors, nothing more. Ron61 and CompClassics like this. The AN fitting size is a -6 male to the hose, I believe the differential case is tapped for a ? NPT thread. I will be getting my clients differential and damaged parts back from the rebuilder today. I’ll post the pipe thread size when I have it in hand. Alf your breather is in the correct spot according to Kirkham’s recommendations. The Kirkham differentials are shipped with this AN fitting already in place. rodneym and Riverside racer like this. Last edited by CompClassics; 04-17-2019 at 08:43 AM..
I’ll have to get under mine and see if I can feel the top of my diff to see what I have on top of mine.... a fitting or a plug. Not sure how much room there is to work or if I’ll need to drop the diff to get my lines installed to KMCs recommended location. Granted.... my catch can is dry as a bone as is the area around it so no fluid is overflowing from there but even if the can is somewhat filling during a drive I’m still missing fluid from the diff. What a pain!!!! Last edited by E5USMC; 04-17-2019 at 04:27 PM.. Picked up the differential today. I’ll post photos later. Last edited by CompClassics; 04-18-2019 at 08:04 AM.. 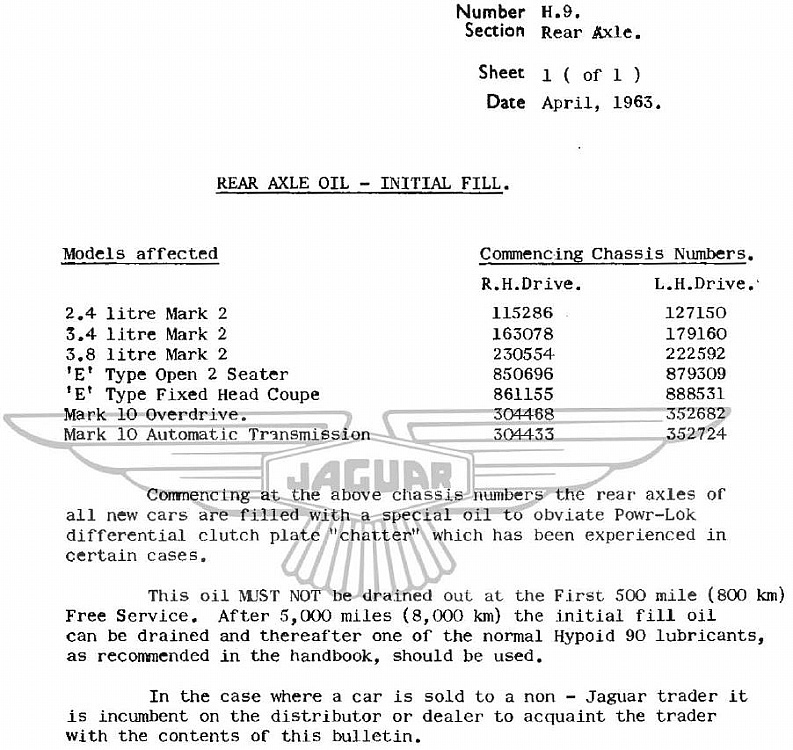 Speaking of Powr-Lok break in (which no one was, but who's counting), Jaguar released an interesting service bulletin back in the early 1960's specifically advising not to do the recommended differential oil change at 500 miles if you had a Powr-Lok (which they had always prescribed up until then). Now, if you've gone to the trouble of having your Jag rear diff rebuilt by super-pros then, by all means, follow their directions for break in and not a 50 year old service bulletin. I don't think they even had climbing gear lube back then much less friction mods specified by today's rebuilders. Regardless, here it is should anyone ever ask you about it, which they won't. I agree with you about it being the return line for the differential cooler, that is the way I have my car plumbed. I also changed out the differential cover on my car very early on when the Kirkhams mistakingly putting jeep covers with the higher oil capacity that were leaking everywhere to a proper Jaguar cover. Because of the lack of an oil deflector on the billet aluminum cover that Kirkham supplied with this differential it seems to be the most feasible spot for a differential breather in this circumstance. 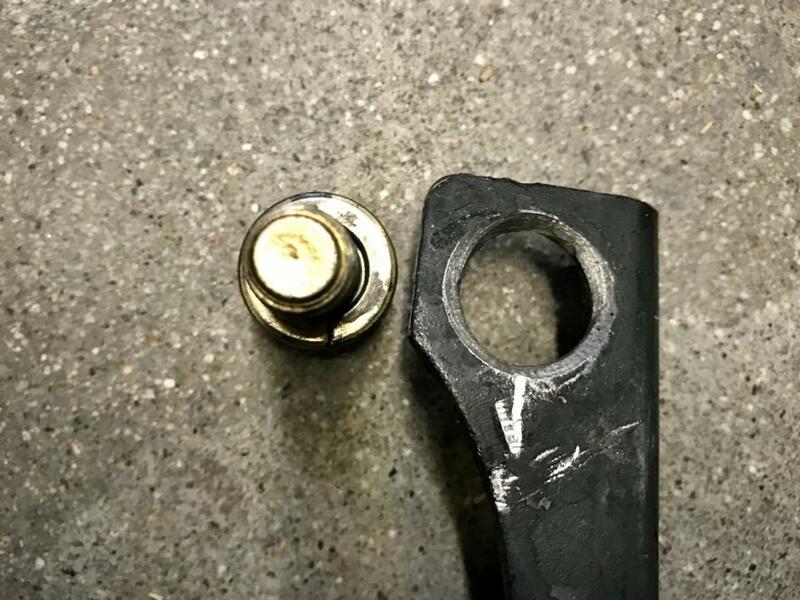 When I picked up the differential from the rebuilders they had reinstalled all of the differential mounts except the pinion support mount, they felt that someone had compromised the mounting breaker holes and that they might pull through, why would someone have done this on a purpose built part? Last edited by CompClassics; 04-18-2019 at 05:31 PM..
Looks like another part that the manufacturer is not going to back. I will say this my beef is not with Kirkham on this issue as I firmly believe what I was told by David and others that have PM’d me on this subject. Last edited by CompClassics; 04-18-2019 at 05:37 PM.. I know you should not have to, but not that big of a deal to fix it, do a little welding and drill the holes where they should be. While the welder is out weld the baffle on the diff cover. Last edited by cobrakiwi; 04-18-2019 at 06:13 PM.. I remember your plight well, it is far better to make these deficiencies public if the manufacturer is not willing to have respect for the person that has bought their product. I am going to reroute the breather per Kirkham’s instructions and block off the other port. As per the transmission mount, that can be corrected too, as many of the issues with this chassis already have been. This car was not a case of you get what you pay for. Last edited by CompClassics; 04-18-2019 at 06:20 PM..
Last edited by Morris; 04-18-2019 at 06:36 PM.. I fully agree with your assembly procedure, this was a simple case of an amateur hour move. These are simply issues that the purchaser shouldn’t have to be responsible for or expect for such an expensive “roller”. Last edited by CompClassics; 04-18-2019 at 07:04 PM.. The threads in the differential case are 1/2 NPT. The fitting to the hose is a dash 6. Actually it wasn't a mistake. The differential covers with the hole in the Cobra location (lower) have not been available for a long time now. 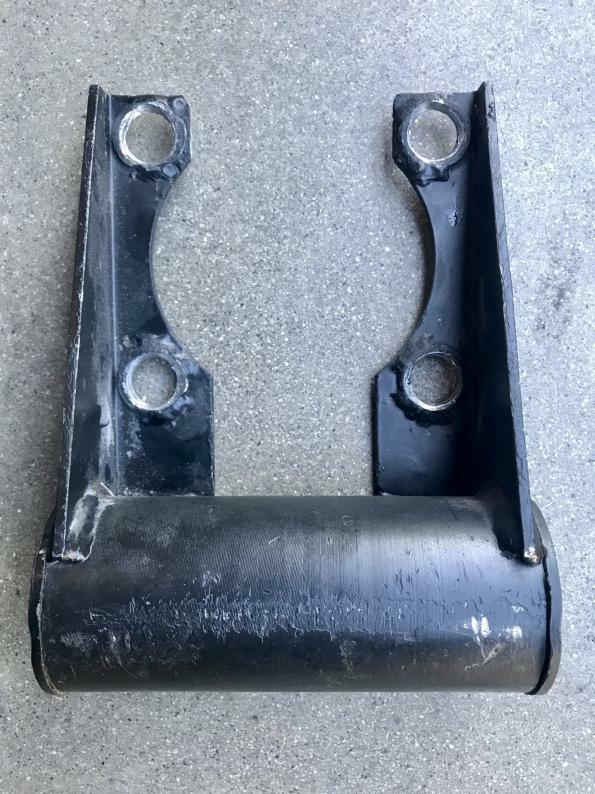 The jeep covers are also much thicker so they tend to hold the back of the differential case together better than the original covers which were quite thin (they are only something like 1/16" thick). We ultimately decided to billet the covers for a variety of reasons, the most important being we were able to put the fill hole in the right location. If anyone can figure out how the billet in the deflector I'd LOVE to hear!!! I'm really surprised at the size of those holes??? That is some really clean work--as always. Thanks for sharing the pics--I may need to "borrow" some of your ideas!! !